The final destination for the Turkey was The Thanksgiving Potluck Dinner. As i have mentioned before that it will take me 80 minutes to finish roasting the prepared turkey and i was right. The turkey came out of the oven 80 minutes in perfection. The color was more than golden brown and the meat temperature was the correct temperature as recommended. I am sorry that i forgot to take a picture of the bird when it came out of the oven as a friend came and i had to help her to make her dish for the potluck. My friend, Meow, had wanted to mashed sweet potatoes as she confessed that that was what she could come with on her own but i told her that i will guide her to something more interesting - Bacon Wraps. While my friend's dish was broiling in the oven, i had to debone the turkey and time was not with me at that moment. With hands full of grease, using the camera was not possible - i will be banned for life from touching the camera if i had tried to use it. Thank goodness that when i had done cutting up the turkey, the owner of the camera appeared, all dolled up pretty and i requested for help although the plating was not compleled. 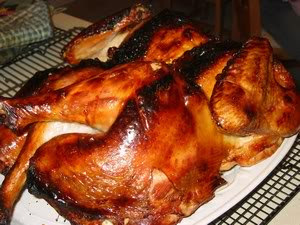 So, at least now i have a picture of my roasted turkey. ok, time to remove the Bacon Wraps from the oven - crispy and unbelievablly fragrant. I will post the recipe in my next posting. I did not make any Sausage Dressing this year but instead i cooked rice. It's already day two since we started brining the turkey and time to think of preparing the gravy. With so many other dishes to get on the table, sometimes the turkey gravy can be a mealtime anxiety-inducer. Fear not! We are preparing it today, Wednesday, ahead and guess what? No stress and there is plenty of time to prepare The Sausage Dressing, leaving the sides for tomorrow. Hey, don't forget me, the turkey that has been brined for 8 hours!!!. This dish is from the Chinese migratory Hakka dialect group and is several hundred years old. The Hakkas, especially this sub-group called Ho Poh , have a unique tradition regarding this dish as medicinal, a detox meal which is also reputed to boost metabolism and servet his supersalad, with 7 types of vegetables, on the seventh day of Chinese New Year just like the cantonese tradition of serving Yee Sang which most chinese are accustomed to. Ham Cha Farn(salty tea), Looi Cha Farn(ground tea) or Thunder Rice, has a lot of variations. The tea used ,be it green or black signifies and determine the flavour and taste of the dish. It is sometimes kept simple by grinding the tea, add salt to taste and hot boiling water, to make a broth. However others may add roasted peanuts, sesame seeds or both together with the tea leaves and herbs like mint, basil, perilla and saw coriander, in the grinding process to make into an almost medicinal tea broth. This alters the flavour of the dish significantly. The taste however, is not for everyone. Some find it enervating and refreshing, others do not like the bitter or strong herbal notes. The essential ingredients are Farn(Cooked Rice), which can be puffed rice (mee chang) or rice grains fried with garlic and a little oil, prior to cooking and three of the seven ingredients which will determine a good Ham Cha Farn/Looi Cha Farn are dried shrimps, choy poh(preserved radish) and firm tofu. These three are to be sauted and seasoned with sugar and white pepper..
To complement the tea and rice, a wide variety of carefully selected vegetables (including blanched long beans, cabbage, carrots, four-angled beans, chye sim, celery, are used. It should be noted that meat and fish is seldom added to this diah as the the main idea is to eat lots of vegetables, making this dish cheap, hearty , nutritious and a fibre-rich. As part of the Foodbuzz Tastemaker Program, I received 2 bottles of Pace Picante sauce. They arrived just in time, making my cooking dinner easier as i was under the weather and did not feel like cooking an elaborate dinner, not that i cook elaborate everyday but at least it must be substantial. I would usually serve pan-fried fish , fillets or whole fish with some maggi or soya sauce as this way it is more friendly for the younger ones in the household, but since i have Pace Picante Sauce, i decided to serve the adult's portion of the fish with some Pace Picate Sauce, smeared on top, straight from the bottle. It was a hit and thank you Foodbuzz Tastemaker Program. Does anyone know how to select a really juicy, sweet and flavorful watermelon? I am never really lucky although i follow all the best ways suggested like - to look at the color and quality of the flesh, which should be a deep color and absent from white streaks. If it features seeds, they should be deep in color. Oftentimes, however, we do not have this liberty when purchasing watermelon since it is more common to buy a whole, uncut fruit. When choosing a whole watermelon, look for one that is HEAVY for its size with a rind that is relatively smooth and that is neither overly shiny nor overly dull. In addition, one side of the melon should have an area that is distinct in color from the rest of the rind, displaying a yellowish or creamy tone. This is the underbelly, the place that was resting on the ground during ripening, and if the fruit does not have this marking, it may have been harvested prematurely, which will negatively affect its taste, texture and juiciness. Although winter is coming upon us soon, watermelons can still be found in the markets but the season for watermelon is in the summer when they are sweet and of the best quality.No other fruit says summer like the subtly crunchy, thirst quenching watermelon. This post is way overdue and i posted it so that friends from down under and the tropics can enjoy this delicious, refreshing and easy to prepare salad. A stew is a combination of solid food ingredients that have been cooked in liquid and served in the resultant gravy. Ingredients in a stew can include any combination of vegetables (such as carrots, potatoes, beans, peppers and tomatoes etc. ), meat, especially tougher meats suitable for slow-cooking, such as beef. Poultry, sausages, and seafood are also used. While water can be used as the stew-cooking liquid, wine, stock, and beer are also common. Seasoning and flavourings may also be added. Stews are typically cooked at a relatively low temperature (simmered, not boiled), allowing flavors to mingle.Stewing is suitable for the least tender cuts of meat that become tender and juicy with the slow moist heat method. This makes it popular in low-cost cooking. Cuts having a certain amount of marbling and gelatinous connective tissue give moist, juicy stews, while lean meat may easily become dry. Stews may be thickened by reduction or with flour, either by coating pieces of meat with flour before searing, or by using a roux or beurre manié, a dough consisting of equal parts of butter and flour. Thickeners like cornstarch or arrowroot may also be used. and i find this list of STEWS from all over the world very interesting, perhaps planning to cook from this list if the ingredients are available and the method of cooking is possible. Chankonabe, a Japanese dish flavoured with soy sauce or miso. Chankonabe is traditionally eaten by sumo wrestlers. Daube, a French stew made with cubed beef braised in wine, vegetables, garlic, and herbs. Dinuguan, pork blood stew from the Philippines. Feijoada, Brazilian or Portuguese bean stew. Főzelék, a thick Hungarian vegetable dish. Ghormeh Sabzi, an Iranian stew with green herbs, dried limes, beans and meat. Haleem, an Pakistani lentil/mutton stew. Ishtu, a curry in Kerala, India made from chicken or mutton, potato, and coconut milk. Jjigae, a diverse range of Korean stews. Kare-kare, stewed beef or oxtail and vegetables in peanut sauce from the Philippines. Karelian hot pot, from the region of Karelia in eastern Finland. Khash, a stew from Armenia and Georgia. Khoresht, a variety of Persian stews, often prepared with saffron. Kokkinisto, a Greek stew with red meat, in a tomato passata with shallots, cinnamon and other spices. Nihari, a Pakistani beef stew made overnight and served for breakfast. Semur, a typical Javanese stew with beef or chicken, potatoes, carrots, various spices and kecap manis (sweet soy sauce).from Indonesia. Tagine, a Moroccan stew, named after the conical pot in which it is traditionally cooked and/or served in. I have many a time been told that 'lo soi' means 'old water' but am not able to argue that it is not so, you know why? if you can't read or write chinese, i don't stand a chance in this debate.